Earlier this month, Mother Nature threw ice golf balls through numerous panes of glass at our beloved Garfield Park Conservatory. A week ago today, she aimed some major gusts at the windy city and the burbs, knocking down trees and taking out power. Unfortunately, that was the day we had video interviews and a sneak peek at Science + You scheduled. Kohl was unwittingly caught up in more of a science experiment than they bargained for. 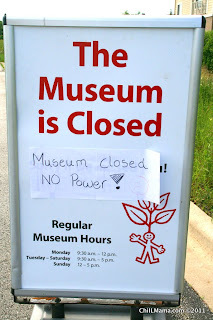 We spent 2 hours in the car driving out and back to Kohl Children's Museum in Glenview, in rush hour, just to find the museum eerie and dark. I was thinking about the poor baby chicks in the incubator, and wondering if they survived without power. It was an inconvenience for us...but maybe a matter of life and death for them! Kohl Children’s Museum of Greater Chicago is proud to present the world debut of Science + You, a groundbreaking new exhibit designed in conjunction with scientists at Abbott, the global health care company with headquarters in Lake County. The exhibit will be unveiled to the public Tuesday July 19th. Underwritten by Abbott's philanthropic foundation, the Abbott Fund, the 1,200 sq. ft. Science + You exhibit offers a child-sized laboratory where children can explore how scientists impact health and wellness. Through hands-on, interactive machinery, processes and technology, Science + You demonstrates the role science plays in keeping the body healthy. A demonstration area of the exhibit also will allow Abbott scientists to visit and perform fun and interactive scientific experiments appropriate for young children. Following its Kohl Children’s Museum debut, Science + You will be installed into other children’s museums in the United States and abroad, with content presented in multiple languages. 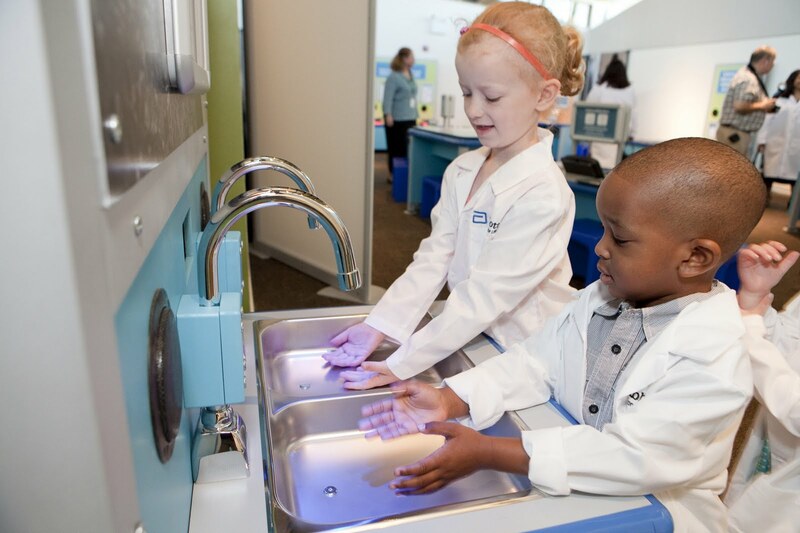 “When designing the Science + You exhibit, we visited Abbott's research labs, and, consulted with Abbott scientists and nutritionists to find effective ways to communicate about scientific discovery and healthy lifestyles,” said Mary Trieschmann, Vice President of Programs at Kohl Children’s Museum. Children will enter the exhibit as if entering a real-life laboratory. At the first station they can pretend to wash their hands and then wipe their feet on a special gel-like floor mat that changes colors to represent the dirt particles it is removing. Children can even walk through a pretend shower to be bathed in blue lights before they put on their white lab coat. Graphics will communicate how important it is for scientists to work in a clean environment. 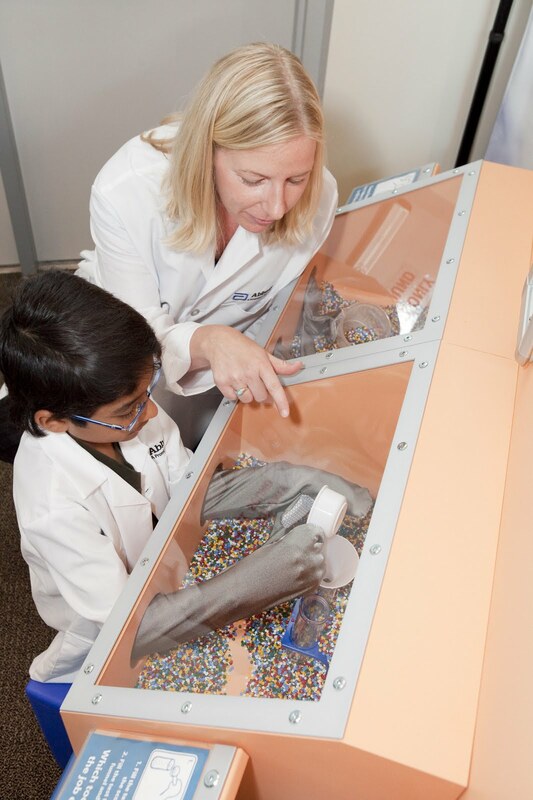 Demonstrating how antibodies act in the body, this component of the exhibit offers children the opportunity to understand a complex process through play. A clear plexiglas structure is filled with magnetic balls, which represent “germs” in the body. Four stations outside the structure include a moveable antibody that children can use to manipulate germs. Children use the antibodies to collect the germs within the structure and move them to the “white blood cell” tube. Once the germs have been transferred into the white blood cell tube, they are dropped into a hopper. When all the germs are collected in the hopper the activity is complete and the body deemed healthy. The germs are dropped back into the center of the structure and the activity begins again. A video also demonstrates how real antibodies in the body collect germs and feed them to white blood cells. Children can use a glovebox, a sealed container used by real-life scientists, with gloves built into the sides allowing one to manipulate objects safely. Demonstrating how scientists use a glovebox to contain materials as well as protect themselves, the children will wear thick gloves to measure substances using beakers, funnels and other lab equipment. Exploring how scientists use machines to mix liquids and solids, this component of the exhibit demonstrates how different types of equipment function. Children can see the machines in action, and can also manually mix and separate liquids and solids themselves. This exhibit features a specialized Wentzscope and video microscopes that magnify objects on a large video screen, allowing younger children to compare and contrast an array of natural and man-made items up close. the components is achieved, children hear a congratulatory message. The exhibit promotes being active in a variety of ways, from traditional exercise such as riding a bike, to common activities such as cleaning the house, doing the dishes or walking to school. In the test kitchen children will make a ‘healthy soup’ choosing their own combination of appropriate ingredients. Teaching children the importance of a balanced diet, this exhibit has stations with soup pots that can hold up to six ingredients. Children pick the ingredients from the five food groups. The burner under their soup pot lights up when they’ve selected the correct balance of healthy ingredients. Children can share their scientific thoughts and reflections after experiencing in the exhibit. A variety of images, drawings and terminology from the exhibit is provided that children can use to create their own collage. A display wall allows children to share their collage reflection with the public. Grease pencils will also be provided for children to write down their impressions. “We look forward to seeing children’s reaction to this new exhibit from a visual perspective with the scientific reflection component. As the exhibit tours, there are opportunities to make modifications based on findings from the exhibit’s stay at Kohl Children’s Museum,” said Trieschmann.